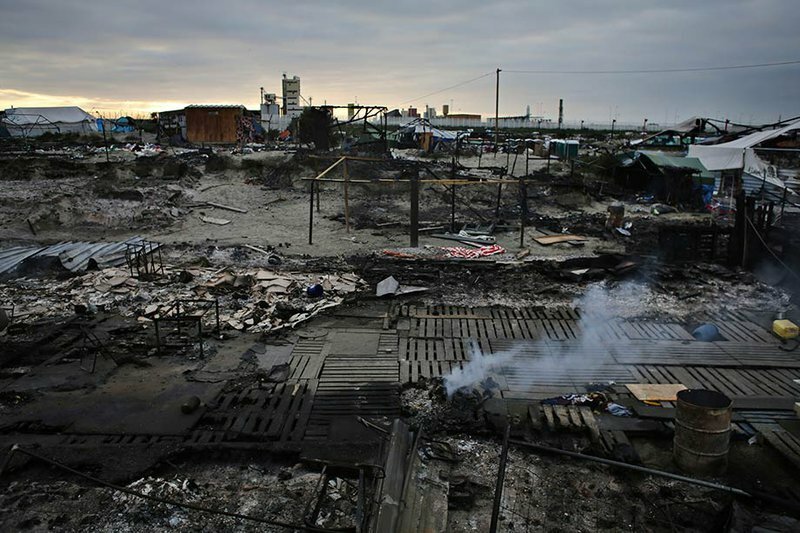 View of "the Jungle" camp near Calais after it was torched on 28 October 2016. Thousands of migrants dispersed this week from the now-torched camp they had called home in Calais. Thibault Camus/Press Assocation. All rights reserved. Before the ‘Jungle’ camp in Calais is erased entirely, both from the patch of earth on which it stands and from the perennially amnesic popular consciousness, it is worth reflecting on the what the camp represents and the issues it raises in the wider context of the migration debate and policy. Calais, as a port town, has historically been a place of migration. More specifically it has been a transit point, a place through which people pass to reach the UK or somewhere else in France or Europe. It became a major hub for people wishing to claim asylum in Britain in the 1990s, and towards the end of that decade the French Red Cross opened a refugee camp in Sangatte. Converted out of a warehouse on the eastern edges of the town, Sangatte was purposed to house the thousands of refugees sleeping rough in and around Calais. The camp quickly reached its maximum capacity. People nevertheless continued to arrive, and conditions grew steadily worse. 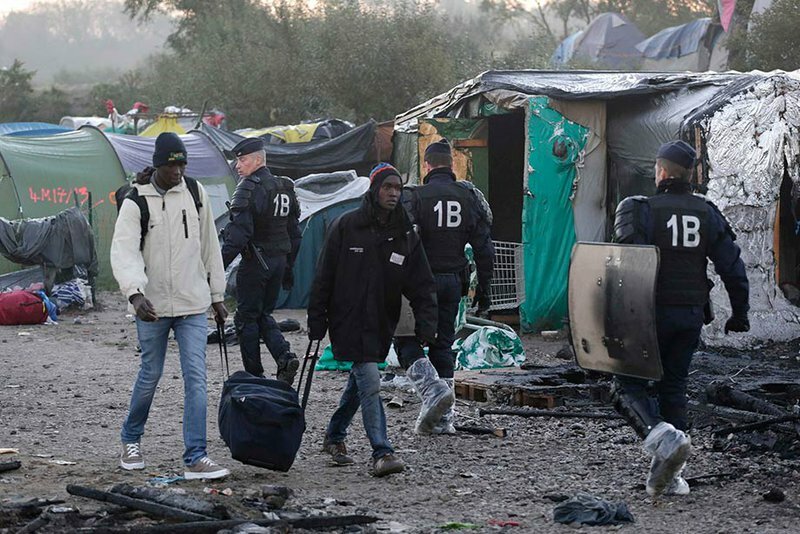 Periodic outbreaks of violence and unrest found their way into the mainstream media, and pressure grew on the French government to do something about the camp. Nicholas Sarkozy, then the interior minister, responded by ordering the camp to be shut down in 2002, after the Brits agreed to grant a portion of Sangatte’s residents asylum in Britain. Unsurprisingly, the closure of Sangatte did not alter Calais’ strategic importance for migration. Many migrants simply relocated to various smaller camps in the surrounding area. One of these camps continued to expand, and despite some interventions managed to avoid the periodic expulsions and demolitions that put paid to some of other temporary settlements. This tent city came to be known as ‘the Jungle’. Sending in police to forcibly expel inhabitants and backhoes to demolish the structures will have no effect on patterns of migration. Fourteen years after the closure of Sangatte, it is now the Jungle’s turn to face the low groan of the bulldozers. It would appear political memory is as prone to amnesia as popular consciousness; will they never learn? Demolishing the camps is simply lancing the most visible boil, while ignoring the fever gripping the body. It is the futile act of a state overwhelmed by the complexity of the situation, lashing out in a way that will ensure maximum media coverage and perhaps short-term political gain, while doing absolutely nothing to address the underlying issues surrounding the now-perpetual migration crisis. It hardly needs to be said that sending in police to forcibly expel inhabitants and backhoes to demolish the structures will have no effect on patterns of migration. Desperate people wanting to get to the UK will continue to flock to Calais. And if not Calais, Dunkirk. And if not Dunkirk, then the next patch of French coastline that offers a viable launching point for crossing the channel. Residents leave the Jungle camp, on the outskirts of Calais, before it is demolished by the authorities on 27 October 2016. Emilio Morenatti/Press Assocation. All rights reserved. Today the French coastline acts as the externalised border of Britain. In European political-speak, the term refers to the practice of pushing frontiers back to neighbouring countries (often outside the EU) to effectively sever a migration route before applying for asylum from within a territory becomes a possibility. Security checks and various registration procedures thus take place on the French side of the channel (a state of affairs that the Brexit referendum might, ironically, undermine). The practice of externalising borders comes with many risks and problems, but one of the most obvious is that it simply shifts the frontier from one place to another rather than actually addressing the issue. It’s the geopolitical version of kicking the can down the road. The border is still a highly-secured, contested space where the human rights of migrants take a back seat, and the new gatekeeper will almost certainly want something in return (as we’ve seen with the contentious EU-Turkey deal). The result is a collision of two different states’ interests, producing a void in which neither state takes responsibility for the vulnerable people caught in the middle. A non-place, the Jungle is on French territory but not governed by French laws or worthy of French state assistance. In the Jungle, the role of the state has been limited to what can kindly be termed ‘security’. The NGOs operating in Calais have been responsible for providing food, tents, clothing, medical supplies, education and psychological support. Though it must be said that these NGOs are doing an absolutely magnificent job, showing once again that the best of humanity is often found in the face of the worst, the key question remains: where is the state – any state – in all this? The French authorities must bear the brunt of the blame, despite the border externalisation. The French state has essentially declared the Jungle off-limits. A non-place, the Jungle is on French territory but not governed by French laws or worthy of French state assistance. This can be seen most clearly in the events of the past few days. On Wednesday, Pascal Brice, head of France’s office for refugees and stateless people remarked that “all the people who were leaving the ‘Jungle’ are now welcomed in France, in good conditions in accommodation centres”. He speaks as if the Jungle were located on a distant island unreachable by the largesse of the French state, rather than in a field on the outskirts of Calais. He suggests that anyone living in the Jungle could not be offered basic aid or assistance precisely because they lived in the Jungle – as if it were a ring-fenced reservation or quarantine zone. Why weren’t these ‘good conditions’ provided over the past ten years? Why has this welcoming hand been a baton-wielding fist or an indifferent shrug for the past decade? These questions need answers, but they will not be forthcoming. In the afternoon of 26 October, Fabienne Buci, Calais’ regional prefect, announced that the camp had been cleared. Anyone who saw the camp then would have reason to disagree, as they watched hundreds of unaccompanied minors sent back to the still smouldering Jungle, apparently expected to bed down among the ruins. Presumably, French authorities were too busy congratulating themselves on having successfully completed the ‘operation’ to worry about where these children would sleep. According to news reports it took the French authorities a full week to start moving these last inhabitants out of the wreckage. In the interim NGOs have once again heroically stepped up to the task, finding accommodation for many of the children in a nearby warehouse and the Chemin des Dunes school, as well as handing water and other provisions through the fence of this now cordoned off zone. But how did it come to this? Why, when vulnerable children were at risk, were the authorities found wanting? The blame does not lie solely with the French, as Britain has also demonstrably been failing to live up to its promises and obligations. Under the Dubs amendment announced in May, Britain agreed to accept around 3,000 unaccompanied minors; as of last week, Britain had welcomed precisely zero. The very fact that these children were left in the Jungle after it was ‘cleared’ was due at least in part to foot-dragging, bureaucratic meandering and reluctance on the part of British authorities. The burden to care for vulnerable people caught up in this has fallen increasingly on NGOs. They are managing superbly, and deserve every ounce of support they elicit, but they should not be doing this alone while the two key state actors either dither or demolish. An earlier version of this article was published on 29 October by Novara Media.